Need some earth tags for your cable glands to ensure they match up with safety standards? Kingpin Manufacturing are here to help. Earth tags provide an earth bond attachment for cable glands, similar to the ones found in conventional plugs. In the case of a fault, the earth tag safely channels the electricity towards the ground, keeping anyone coming into contact with the cable gland away from harm. Earth tags are mandatory for all cable gland setups, as specified in BS 6121 Part 5 : 1993. Kingpin’s earth tags are manufactured in various materials to suit the the many cable gland setups on the market. Brass earth tags are the industry standard, but we also manufacture aluminium, copper, mild steel and stainless steel 316 or 304. We generally manufacture in Banjo and semi-tan gentle shape and in any material and cut to any thickness. Our sizes go from M12 to M130 and ½” npt to 4” npt. 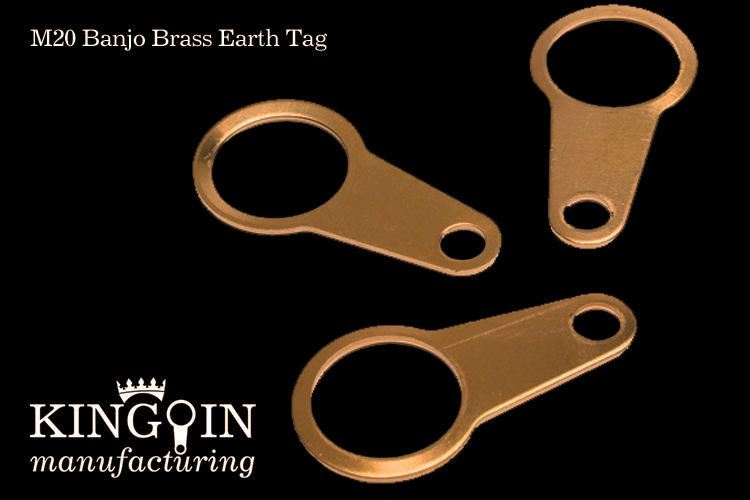 Beyond brass earth tags, Kingpin Manufacturing also provides a wealth of other components to a huge range of industries. Tasked with maintaining the structural integrity of the cable gland and ensuring that it can’t be pulled apart easily, our locknuts are built to the same high standards as our earth tags. 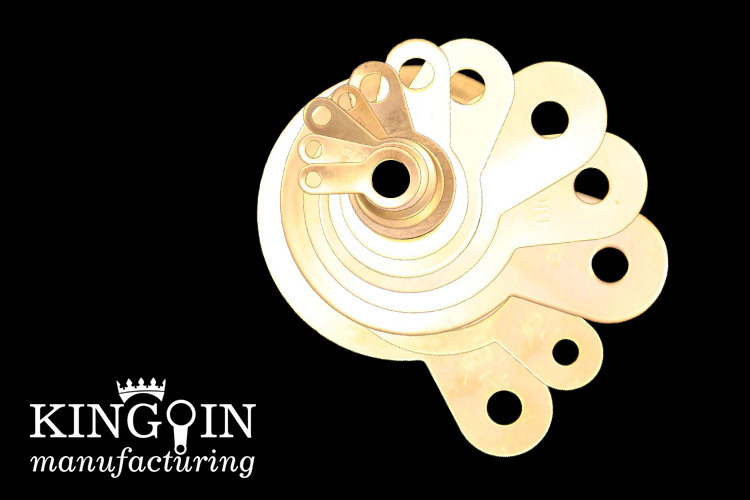 The team at Kingpin is also highly experienced in producing a fantastic range of washers. These components ensure that foreign bodies, such as water and sand, don’t find their way into the interior of the cable gland. Both our washers and our locknuts are available in various materials and sizes. Whatever you need, our experienced team can provide it for you. Kingpin will quickly become your one-stop-destination for all of your cable gland needs. Earth tags are essential components in the manufacture of cable glands. They ensure safety and play a key role in reducing the risk of electrical shock in industries where high levels of electricity are prevalent. Lives can be put at risk if these components are manufactured incorrectly or installed poorly, but, thankfully, the team at Kingpin have spent countless years developing safe brass earth tags and our knowledge of the cable gland industry is hard to beat. Kingpin Manufacturing remains a family-owned and run business that started in 1999. We have been awarded BS EN ISO 9001:2000 and are recognised by the International Accreditation Board (IAB). We understand the importance of sourcing precise parts in the cable gland industry and that is why the vast majority of our products are machined to incredible detail and custom made to order. Such flexibility and attention to detail has earned the team at Kingpin a reputation for being quick to turnaround orders and ready for any challenge. Custom-built cable gland accessories are the preferred route for most conscientious businesses in this industry, which is why Kingpin’s wide range of products beats anything ‘off-the-shelf’ providers have to offer. It doesn’t matter what part you need producing or how unusual you believe your requirements to be – Kingpin are ready and willing to take on the job. We are just as adept at providing small, individual orders as we are fulfilling large shipments involving thousands of units. We have one aim, which is to be the number one supplier of cable gland accessories to this industry. Put us to the test! We manufacture all of our products in the UK, in-house. Our team of highly specialised staff – backed by an incredible array of machinery and tools – will work on your product from beginning to end. They benefit from many years’ collective experience in the industry and we’re committed to their on-going development by investing in the latest training and techniques. Having been in this industry since 1999, we know how important it is for our customers to receive the products we manufacture quickly, and that’s why we are committed to keeping all production in-house. That means, no matter how large or small your oder, we can supply it quickly, which is vital in today’s busy world. We want to be your earth tag provider, which is why we do everything possible to keep our prices competitive. You won’t find any inflated pricing for specialised components here – we provide our customers with the fairest possible prices, whether they are ordering a one-off piece or thousands of units. Kingpin Manufacturing doesn’t take the work its team performs lightly. We know that earth tags are vital safety components, so producing high quality products remains our top priority. Anything less would be irresponsible. You aren’t dealing with any go-betweens when you work with us; the connection between customer and supplier is direct. This ensures that we can manufacture the exact earth tags you need, every single time. It also means you no longer have to suffer from inadequate, generic parts. Our team in Birmingham are waiting to take your call. No order is too large or too small and no request too unusual. So, if you’re after brass earth tags, or anything else relating to these essential components, please get in touch today to discuss your requirements. If you have any questions regarding our prices, manufacturing capabilities, turn-around times, or anything else entirely, please do get in touch. We will be more than happy to show you why Kingpin is one of the most trusted and respected names in the cable gland industry.